Creating a fused glass sculpture is a many facetted process. Fusable glass is a special glass manufactured to be used in a special glass filn. The glasss comes in flat sheets in either 2mm or 3 mm thick. Thesheets come insizes 2 feet by 4 feet which then can be cut into the desired lenghtns needed for the project.TheThe glass comes in a multitude of colors and textures as well. When creating a sculpture the glass is cut to the desired shapes and placed together on a kiln fireing shelf. This shelf is placed in the kiln which has various program times to fuse the glass to a specific outcome. In order to create a 3 dimensional sculpture the glass has to be fired several times to create the final sculpture. In the first firing the glass comes out flat. In order to create depth and volum heat resistant molds are made that the glass can conform to. So in fact the mold is a sculpture that the glass will become. The process for the glass to conform to the mold is called slumping becacuare the glass actually melts or slumps to the shape of the mold. This takes another firing step in the kiln. When I make a torso sculpture the front and the back are made seperatly,then joined together which special glues to make one figure. Each firing process takes 12 -16 hours to comple and there are several kiln firing for each stage until the sculpture is complete. Working In cement requires a lot more time and patience then working in other materials. First of all rather than being a taking away process as with stone ,working in cement is like working in clay since it is a buildup process. Armatures or frames are made to how the shape of the sculpture and the cement is added in stages to build up the mass of the form. Also reinforcement material is added to give added strength to the sculpture. These materials can include chicken wire, wire wool and rebar. The fishing process is very time sensitive because the cement needs to be worked its various setting stages. 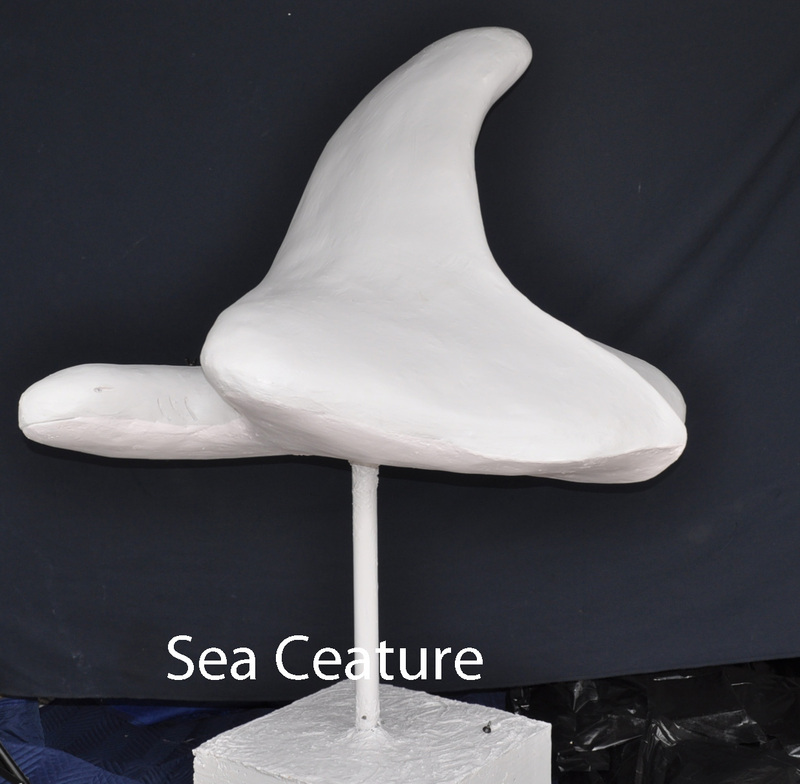 The final result creates the most durable outdoor sculpture.